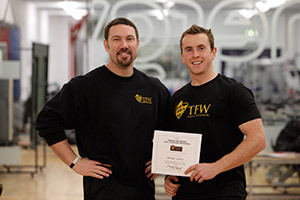 The TFW Level 2 course is the second half of the TFW Certification. Once you have passed the TFW Level 1, you are eligible to take the Level 2 to complete the course and become Warrior Certified TM. This second level of the course goes into deeper detail about the TFW System and covers areas of the program such as the speed and strength training that are not covered during the Level 1 course. During Level 2, you will learn directly from the creator of the Training for Warrior’s System, Martin Rooney in an online format. The Level 2 content is made up of over 20 hours of training and education videos as well as 4 interactive webinars with Martin Rooney. The videos have been broken up into 15 individual modules with each module consisting of between 5 and 15 chapters to improve your learning experience. The 15 training modules of the course are released sequentially over a 4-week period of the course. Each week you will get access to new modules and invited to the live coaching call with Martin Rooney. The Training For Warriors Level 2 is delivered to you completely online through our private members area which you will have instant access upon completing your registration. Two big advantages to online learning are that you can study at your own pace over 8 weeks without the added cost of travel. During the course, you can work through all of the material at a rate with which you are comfortable and watch each video many times to ensure you fully absorb and understand the information. The TFW Certification can only be attained by passing the brief examination given at the end of both the Level 1 and Level 2 courses. The test is 30 questions and multiple choice. Although the test is optional, you will be required to pass in order to achieve the rights and privileges associated with being a certified TFW Instructor. The Training for Warriors Certification is recommended for personal trainers, strength and conditioning coaches, athletes, martial artists, physical therapists, and any fitness-minded individual interested in both deepening his or her knowledge of the TFW System and how they can use it to help themselves and others Bring Out The Warrior Within.